Equipment used in the present "digital era" requires a camera support system more stable and versatile than ever. Manfrotto geared tripods have always been the first choice of the professional photographer, whether in the studio or on location, for their medium and large format cameras. 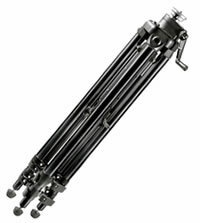 All black anodized aluminum construction and unrivalled in stability, the 475B Pro Geared Tripod incorporates a unique center brace strut system, reliable quick-action leg locks, non-rollback three faceted center column, spirit level and rubber/metal spiked feet. Manfrotto has always been concerned with the balance between minimum and maximum height, tripod weight, and load capacity. The 475B is no exception. Designed by incorporating the best features of previous tripods, the 475B has added two important features. The new center brace system can be operated in a symmetric or asymmetric way. This allows the best of both worlds: speed by locking the braces so that all of the legs will be spread to the same angle, or by individually setting the angle of each leg for the ultimate in tripod positioning. To avoid annoying delays in leveling the tripod, the telescopic center braces have been designed with two "click stop" positions that allow you to easily find the same spread angle on all three legs. The second improvement has been made to the leg locking system. The 475B incorporates the new Quick Action leg locks. These locks have an amazingly quick and secure locking range. All it takes is a 45° flip of the lever to lock and unlock each section.